"Cataclysm" is my column in the monthly "Catalyst" newsletter I co-edit for our church, Unitarian Universalists of Grants Pass (www.uufgp.org). My ham radio hiking trips have taught me a lot about estimates. When I post an “Alert” of an upcoming trip, I always include “ETA Approximate,” since driving and hiking take as long as they take, not as long as I planned them to take. One also picks up lessons about certainty and doubt along the way. GPS is never in doubt. Newer models don't say “Recalculating” when you stray from their planned path. They still recalculate; they just don't say so. It's child's play for GPS to get you close to where you're going. But the last part of the itinerary is often little better than the “Here be monsters” on old maps. When I'm looking for a hilltop, I usually progress from Interstate, to local road, to unpaved road to, well, often no road at all. The GPS is unflappable, nonchalantly ordering me to “Navigate Off-Road,” while indicating a direction that, often as not, asks me to scale a vertical cliff to my destination. The instructions aren't wrong – they just can't be followed. Early in my radio career, a fellow engineer confided to me that “We're all just penciled-in here.” It was, and remains a disturbing truth. What helps me deal with the uncertainties of life is the conviction that my improvisations and course corrections are no better or worse than the plans of those who are more certain that they're right and that they're right on course. How one earns my wave – or doesn't. I exercise-walk miles each week, usually along roads. Following safety advice, I walk on the left side of the road. Another way I try to keep myself safe is by waving to drivers. My rule is simple: If you move over to the left even a bit to leave me more room, I'll give you a casual wave. It's a tiny thing, but it acknowledges that the driver has gone out of her/his way to keep me a bit safer, and that I appreciate it. Day after day, I wave to drivers who move over while I move to the left as much as I can as cars approach. I don't rely on them: My pedestrian safety is mostly my own responsibility. The driver makes a mini-swerve; I step onto the shoulder and respond with a mini-wave. It's a tiny human contact, but one that keeps me a skosh safer than I would have been without it. I hope. 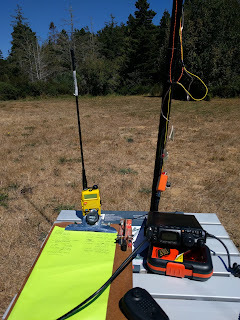 One of the reasons I've loved ham radio for fifty years is that it's actually many different hobbies. If the Biathlon is an unlikely pairing of skiing and shooting, “Summits On The Air,” SOTA, pairs hiking and mountain climbing with amateur radio, king of couch potato pastimes. 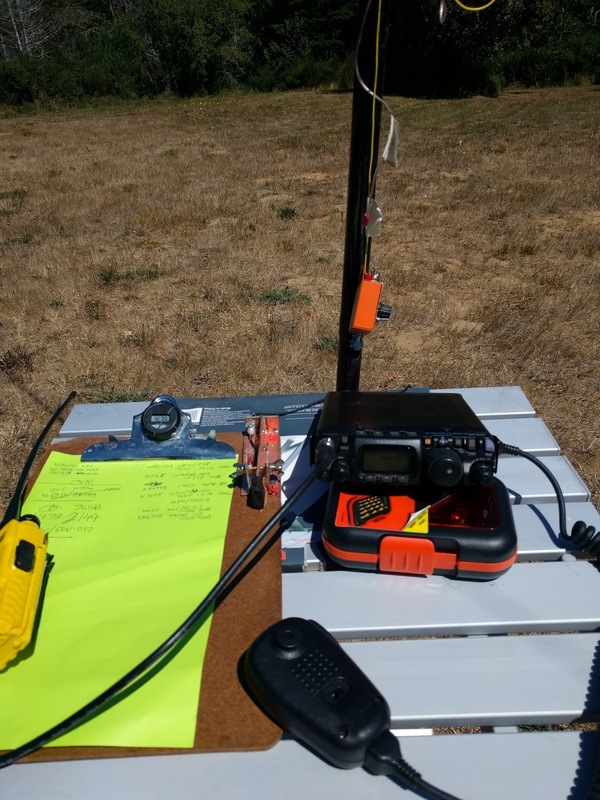 Founded in 2002, SOTA began in England as an awards program to recognize achievements involving ham radio from mountain tops, promontories and hills. Hundreds of ham operators around the world participate. “Activators” carry small, portable ham radio equipment to one of the designated sites. From there, they make contact with “Chasers.” There are awards for both kinds of participants: Activators earn points toward the coveted “Mountain Goat” award, while Chasers work toward the less-coveted “Shack Sloth” award. I've done a few activations. It's tricky in Oregon, where the back country is often privately owned and peopled by suspicious folks with firearms. Mostly I confine myself to parks, National Forests and so forth. In theory, one could just drive up a hill, but the spirit of SOTA requires at least some hiking, and stations cannot be connected to vehicles, meaning battery-operated gear is a must. The black box is a Yaesu FT-817D, a tiny Swiss-Army-Knife of a radio that operates on many bands and in many operating modes. Most of the contacts I make are in Morse code or Single-Sideband (“SSB”) voice. The yellow handheld VHF radio handles short-range contacts, and the funny thing attached to the clipboard is the “paddle” I use to send Morse. The tiny orange box is an “Antenna tuner,” which matches the antenna to the radio. The last photo shows the minuscule (for me, at least!) display on the Yaesu, operating on 7.286 megaHertz, the voice part of the ham “40 meter” band. Sound interesting? Check out SOTA at www.sota.org.uk . If you're thinking about ham radio, you can see me. Morse code is no longer needed to get a ham license. I'd welcome hiking companions on any of my activations. I'm thinking of Table Rock next; or, as we call it: W7O/CS-157, for Oregon>Cascades South>Summit 157. To be a high-school boy is to live in a world of desires, many of them unrealistic. In 1966, when I was 16, the word “Geek” had not been coined, but my tiny coterie of friends and I were geeks nonetheless. While other boys at Palo Alto High School lusted after muscle cars, my pals and I in the nerdy worlds of ham radio and computers wanted the fancy iron and sheet metal of those fields. We learned the rudiments of programming on the school district office's IBM 1620, a room-sized, yet idiot (by modern standards) computer. No one thought at the time that anyone would want to own a computer. But ham radio was different. Until that time, most amateur radio stations consisted of a large, heavy, tube-filled box called a “Receiver,” and a larger, heavier, tube-filled box called a “Transmitter.” Just dawning was the age of the “Transceiver,” a smaller unit that combined both. And the most iconic transceiver was the Collins KWM-2. In his Cedar Rapids, Iowa factory, Art Collins' company turned out broadcast transmitters, military and aviation radio gear and amateur radio equipment. As primary developers of both the transceiver and of “SSB,” (Single-Sideband) voice transmission, Collins had launched the transceiver revolution with its 1957 KWM-1. In 1959, the KWM-2 arrived on the scene. My pals and I were totally smitten. Compared to competition of the day, the KWM-2 was wildly expensive. When other transceivers could be had for, say, $400, the Collins was $1,250 ($9,156 in today's dollars). It was a lordly radio, spoken of in hushed tones, and those who owned one were regarded as especially discerning in the otherwise plebeian ham radio world. Only a few thousand were ever built. The KWM-2 still used tubes, and it was still heavy. It did the same functions as competing equipment, but it did so with great panache. The transmitted audio was so clear and undistorted as to be recognized at once on the air. 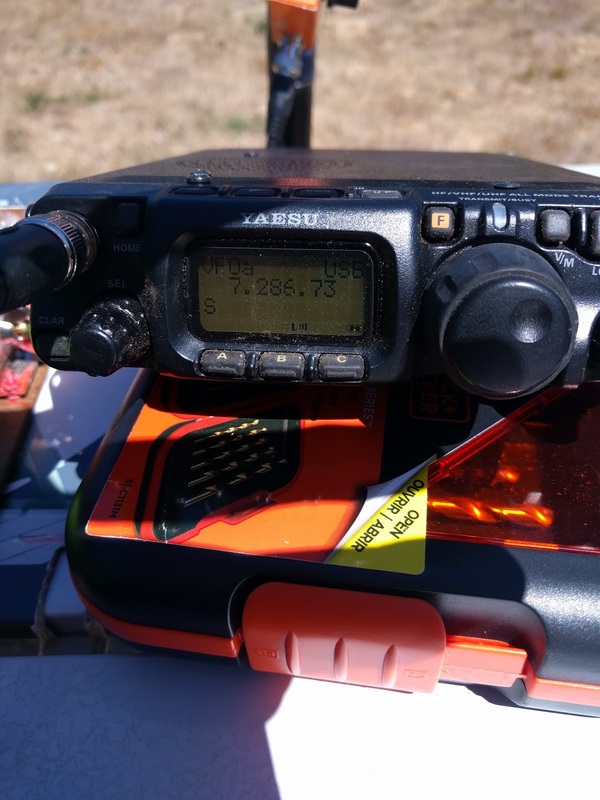 Today, the KWM-2 is still the most-iconic single piece of amateur radio equipment ever built. Like a great car from the same period, it offers few of big pluses of modern equipment. The receiver section, in particular, is easily bettered by modern receiver sections of solid-state transceivers that can be bought for a few hundred dollars, such as the Yaesu FT-450D (next page). But like one for the Red Ryder BB gun, those desires of youth never really leave us. Today, a 50-year-old KWM-2 can cost as much as it did new, or even more. Multiple small businesses operate as niche companies which only work on Collins gear of that era. (Collins stopped making amateur radio equipment in the 1980's). So, when the widow of a Collins collector advertised a KWM-2 on Craigslist, last week, I knew that it offered the possibility of slaking my 50-year thirst to own one of these beauties. Leaving after church Sunday afternoon, I made my way 220 miles or so to Bend, through snowy mountain passes and over slick roads, to examine the radio. A wad of bills hurriedly gathered from multiple ATM's bulged in my wallet. Sadly, the death of the owner is the most-common reason KWM-2's come up for sale. Some predatory hams gloat over having cheated a new widow out of thousands of dollars worth of equipment for $50 or so. In this case, the woman had consulted her late husband's ham radio buddies, so she knew the value of what she had. I think she was impressed (or horrified) that I would drive all the way from southern Oregon just to examine and (maybe) buy the radio. We were simpatico, and I think we both believed all was going to go smoothly. “Well,” she said, “the fellow that bought it bought a lot of other stuff from my husband's station, too. He's mailing me a check for it, but I don't think he'll be too disappointed if I just return his check.” We discussed it for a few minutes. I wanted to be sure not to pressure her into doing something she didn't want to do. She wanted to sell the radio, and realized, I suppose, that any other potential radio buyer would want the radio's power supply, just as I did. Most poignant for her, probably, was the fact that she would be selling both units for $750, instead of $900. After careful and respectful discussion, she decided to go ahead and sell me both the KWM-2 and the PM-2 for the original $750 price. We talked on for a few minutes. I caressed the main tuning dial of the radio, and told her, truthfully, that buying it represented the culmination of a yearning I had carried for 50 years. She told me, mistily, that she was glad the old Collins would be going to a good home. Tragically, her husband had bought the radio shortly before his death, and had never lived to use it. Like a 1960's car, my KWM-2 will not outperform a modern radio. But there's still that ineffable something about it, something my 1966 self would still recognize today.